Subtitle: Isaiah 13 prophecy is now being fulfilled to the letter from America's war against Ancient Babylon, Iraq. "Seize and destroy the whole land" is now becoming reality. However, the form in which this final destruction is taking is so shocking and is so carefully hidden from Western eyes, the average Cutting Edge reader has no idea the kind of genocide which Skull & Bones Bush unleashed upon Iraq and her people. Just as Cutting Edge warned in April, 2003, the Depleted Uranium war waged against Iraq has now turned that country into a toxic wasteland. Uranium contamination now fills the air, the water and the food, causing the entire population to suffer various forms of cancers and other fatal diseases to an extremely high degree. As our troops began their initial attack against Iraq on March 20, 2003, I received a phone call from a subscriber who was a military doctor of a country in the Middle East. This doctor was in the United States for specialized training which can be received only in this country. This doctor was trained in modern desert warfare, and that training included Depleted Uranium Warfare. This doctor spent the better part of two hours educating me on the grim realities of Depleted Uranium (D.U.) munitions. We have written numerous articles on D.U. over the years, and have set them in a section entitled, "Depleted Uranium". Since we have neither the time nor the space to replicate the voluminous information contained in these D.U. articles, please take the time to read at least the first few. If you are new to this subject, you will need to inform yourself as to the particular dangers of this incredibly horrific weapon, as it will destroy about 90% of all troops who served in Iraq as well as about 95% of all Iraqi civilians. When President Bush ordered the invasion of Iraq, he boasted that he had assembled a "Coalition of the Willing" comprised of 49 nations from around the world. Truly, God did assemble a mighty host for battle, drawn from the "uttermost part of the heavens". Furthermore, the next prophetic segment described the effect of the weapons of this mighty worldwide army. "... even the Lord and the weapons of His indignation.." - This army was prophesied to carry out such judgment as to satisfy God's mighty "indignation". At this point in the End of the Age, God is going to finally deliver His complete judgment upon Ancient Babylon (Iraq) because of its vital role in spreading the heinous practice of Witchcraft throughout the world for over 5,000 years now. 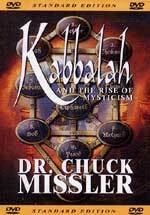 The Kabbalah - the DVD shown to the right -- is a Jewish adaptation of the ancient Witchcraft which originated in Babylon. Today, the secret societies base their Luciferian worship upon Witchcraft in general and upon the Kabbalah in particular. ".. to seize and destroy the whole land." - Depleted Uranium is now in the dust, in the water, in the air, and in the food supply. Truly, Coalition Forces have "seized and destroyed the whole land", just as Isaiah 13:5 pointedly predicted 2,500 years ago! We believe firmly that Bush's invasion of Iraq on March 20, 2003, and the war which has continued since then, plus the final stages of the war which will unfold as the American withdrawal is completed, will deliver the final judgment as revealed in Isaiah 13. We posted an article last year which demonstrated thoroughly how completely this prophecy has been fulfilled. We encourage to read it now, NEWS2171, "President Bush Has Nearly Completed Fulfillment of the End of the Age Isaiah 13 Prophecy Against Ancient Babylon (Iraq)". At this point, let us review recent articles which demonstrate just how thoroughly Coalition Forces have fulfilled this prophecy. Western Mass Media has largely ignored this unfolding disaster, so I had to turn to an Arab source -- Islam Online -- for updates on Depleted Uranium in Iraq. "BAGHDAD— In new Iraq, women like Leila Omar Wassin are heart-broken giving birth to babies born malformed because of the deadly substances years of war have sown in their bodies. 'My first baby died after he was born without legs and the second one died few days ago because his spinal cord was exposed and his head was too big', the 36-old woman told IslamOnline.net. Wassim is one of the victims of the massive bombing of Fallujah in 2004, when the US army admittedly used depleted uranium munitions, which contain low-level radioactive waste. Doctors told Wassim the restricted weapon sowed her body with lethal material that caused her children's birth defects and the subsequent deaths.
" 'If I knew my body was sick, I wouldn’t have tried to bring a new life to the world'." Experts affirm that many like Wassim, especially in areas severely-hit by radioactive material over the years, suffer the same pain.
" 'US troops attacks have been carried out with high quantity of chemicals that makes the genetic material easily affected, resulting in babies being born only to survive for a few hours', Dr. A'dab Hatim, a pediatrician at a Baghdad hospital, told IOL.
" 'The most common malformations are exposed spinal cord, lack of limbs, multiple fingers, eye deformities, large cerebral material and exposed organs', she added. After denying it at first, the Pentagon admitted in November 2005 that white phosphorous, a restricted incendiary weapon, was used in shelling Fallujah. "It also admitted to having used more than 1,200 tons of depleted uranium munitions in Iraq during the 2003 invasion"
When the Pentagon admits to using 1,200 tons of D.U. during the 2003 invasion, you must realize that they have used far more over a far longer of time. In reality, American-led forces have exploded over 4,000 tons of D.U. material from March 20, 2003 to today! I came to the belief that the Illuminati never intended to win the war, since Defense Secretary Rumsfeld committed less than one-half the number of troops which his own generals said they needed. When Rumsfeld refused to commit the level of troops which the Pentagon requested, I could not understand the rationale; however, the specter of Vietnam War raised up over the background, as we all know now that the Illuminati never intended to win that war. The more I studied Depleted Uranium munitions, the more I concluded that the reason only 140,000 troops were committed to the Iraq War was that this size of force would be more than adequate to explode the amount of D.U. munitions required to fatally destroy the entire country. Now, I am more than ever convinced that this is the case. President Bush, Defense Secretary Rumsfeld and the entire Pentagon staff launched this D.U. 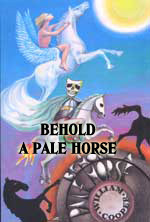 war with the full knowledge and intention of completely destroying Ancient Babylon -- Iraq. "The new cases, and the number of deaths among children, have risen after 'special weaponry' was used in the two massive bombing campaigns in Fallujah in 2004. After denying it at first, the Pentagon admitted in November 2005 that white phosphorous, a restricted incendiary weapon, was used a year earlier in Fallujah." "In addition, depleted uranium (DU) munitions, which contain low-level radioactive waste, were used heavily in Fallujah. The Pentagon admits to having used 1,200 tonnes of DU in Iraq thus far." Notice that the Pentagon admitted to using 1,200 tons of D.U. during the 2003 invasion! Therefore, the Pentagon is still keeping to the same figure five full years later, an obvious lie! "Many doctors believe DU to be the cause of a severe increase in the incidence of cancer in Iraq, as well as among U.S. veterans who served in the 1991 Gulf War and through the current occupation. 'We saw all the colours of the rainbow coming out of the exploding American shells and missiles', Ali Sarhan, a 50-year-old teacher who lived through the two U.S. sieges of 2004 told IPS." These civilians were watching Depleted Uranium munitions strike hard targets. Since the D.U. warhead or the D.U. bullet is made of uranium, it will emit a light hotter than anything on earth and release the colors of the rainbow. But, D.U. is not the only illegal weapon the United States military is using against Iraqi civilians.
" 'I saw bodies that turned into bones and coal right after they were exposed to bombs that we learned later to be phosphorus'." This next segment returns to the daily worry of Depleted Uranium poisoning. "The most worrying is that many of our women have suffered loss of their babies, and some had babies born with deformations." " 'I had two children who had brain damage from birth', 28-year-old Hayfa' Shukur told IPS. 'My husband has been detained by the Americans since November 2004 and so I had to take the children around by myself to hospitals and private clinics. They died. I spent all our savings and borrowed a considerable amount of money." "Shukur said doctors told her that it was use of the restricted weapons that caused her children's brain damage and subsequent deaths, 'but none of them had the courage to give me a written report'." These doctors were afraid of official repercussions if they stated the truth in writing. Not only would the Americans come down upon them with full force, but the Iraqi Shi'ite government would come upon them as they are also afraid of American reprisals. Now, we learn of babies who are afflicted in the manner in which these pictures demonstrate.
" 'Many babies were born with major congenital malformations', a paediatric doctor, speaking on condition of anonymity, told IPS. 'These infants include many with heart defects, cleft lip or palate, Down's syndrome, and limb defects'." "The doctor added, 'I can say all kinds of problems related to toxic pollution took place in Fallujah after the November 2004 massacre'." "Many doctors speak of similar cases and a similar pattern. The indications remain anecdotal, in the absence of either a study, or any available official records. The Fallujah General Hospital administration was unwilling to give any statistics on deformed babies, but one doctor volunteered to speak on condition of anonymity -- for fear of reprisals if seen to be critical of the administration." " 'Maternal exposure to toxins and radioactive material can lead to miscarriage and frequent abortions, still birth, and congenital malformation', the doctor told IPS. There have been many such cases, and the government 'did not move to contain the damage, or present any assistance to the hospital whatsoever. These cases need intensive international efforts that provide the highest and most recent technologies that we will not have here in a hundred years', he added." "A senior Iraqi health ministry official was quoted as saying Feb. 26 that the health sector is under 'great pressure', with scores of doctors killed, an exodus of medical personnel, poor medical infrastructure, and shortage of medicines. 'We are experiencing a big shortage of everything', said the official, 'We don't have enough specialist doctors and medicines, and most of the medical equipment is outdated. We used to get many spinal and head injures, but were unable to do anything as we didn't have enough specialists and medicines', he added. 'Intravenous fluid, which is a simple thing, is not available all the time'. He said no new hospitals had been built since 1986." President Bush may not have built any hospitals since he ordered the invasion, but he sure did sink several billion dollars into a state-of-the-art embassy in Iraq! "Iraqi Health Minister Salih al-Hassnawi highlighted the shortage of medicines at a press conference in Arbil in the Kurdistan region in the north Feb. 22. 'The Iraqi Health Ministry is suffering from an acute shortage of medicines...We have decided to import medicines immediately to meet the needs'." "He said the 2008 health budget meant that total expenditure on medicines, medical equipment and ambulances would amount to an average of 22 dollars per citizen. But this is too late for the unknown number of babies and their families who bore the consequences of the earlier devastation. And it is too little to cover the special needs of babies who survived with deformations." Do not be mislead: the entire population of Iraq is slowly dying of depleted uranium and exposure to the many toxins which the invading forces have spread all over that doomed land. BAGHDAD, July 28 (IslamOnline.net & News Agencies) – Cancer and birth defects have been spreading like wildfire in Iraq since the 1991 US-led Gulf War, prompting doctors to describe them as the Iraqi version of flu. Depleted uranium (DU) used by the United States and its allies against Iraq has taken its toll on around 120,000 to 140,000 Iraqis, according to the latest estimates released by the Iraqi health ministry." Notice that, in July, 2003, had caused the death of up to 140,000 Iraq civilians; how many more have died in the five years since then? And, notice that, in 2003, cancer and birth defects were already as common amongst the civilian population as the flu is common amongst Western nations. "With Iraq becoming an almost radioactive toxic wasteland, the number of birth defects and cancer-ridden Iraqis is on the rise day in and day out due to the lingering effects of the deadly nuclear substance ... Dr Abdul Kazimi, director of Baghdad only nuclear medicine hospital, said 7500 Iraqis are being infected with cancer ever year." This Depleted Uranium disaster began unfolding during the 1991 First Gulf War, and inflicted great damage on the health of Iraqi civilians for 13 full years before President Bush ordered the invasion. This next news segment reveals that this weaponry is fatal to the soldiers wielding the D.U. weapons. "The substance is also blamed for the so-called Gulf War Syndrome, the still-unexplained malady that has reportedly plagued hundreds of thousands of Gulf War veterans. Press reports say about 100,000 tons of DU munitions had been used in the Desert Storm military operation, the first time such a weapon was used in a warfare." The Gulf War Vets Association reports that approximately 75% of all American soldiers who fought in the 1991 Gulf War are now either dead or dying. We will see a similar effect from this 6-year war. In fact, this military doctor about which I talked earlier felt strongly that 90% of all soldiers in the country would come down with one of the diseases caused by Depleted Uranium. "On January 16, 1991, the US launched its allied Desert Storm military operation to liberate Kuwait. The unprecedented US-led aerial bombardment and DU armor-piercing shells forced the Iraqi troops to desperately retreat from Kuwait on February 27. Abdul Hamid Khalifa, an Iraqi specialist on carcinogens, said the crippling 13-year-old US sanctions slapped on Iraq after the war have made matters worse. 'It is a disaster in the broad sense of the word that has slipped out of control', he said." " 'Cases of Iraqi cancer patients started emerging following the 1991 Gulf War with most of the cases concentrating in the south and women taking the brunt'." "The specialist added that infantry troops were identified as receiving the highest exposures to DU radiation. He further said that contaminated water, expired imported food stuff and devastated health infrastructure added insult to injury. Khalifa stressed that environmental pollution is causing 70 percent of cancer cases and food 30 percent. Farras Abd, an Iraqi citizen whose uncle is a DU victim, said prayers are his one and only option." " 'The hospital is running out of medicine and can’t cope with the increasing number of cancer patients, who can’t afford traveling abroad for treatment', he noted." We have included this next section in this report even though we have covered it thoroughly in articles in our "Depleted Uranium" section. "According to the United Nations Environmental Program (UNEP), depleted uranium is a highly dense metal that is the byproduct of the process during which fissionable uranium used to manufacture nuclear bombs and reactor fuel is separated from natural uranium. Uranium, a weakly radioactive element, occurs naturally in soil and water everywhere on Earth, but mainly in trace quantities." "A second, potentially more serious hazard is created when a DU round hits its target. As much as 70 percent of the projectile can burn up on impact, creating a firestorm of ceramic DU oxide particles. The residue of this firestorm is an extremely fine ceramic uranium dust that can spread by the wind, inhaled and absorbed into the human body and absorbed by plants and animals, becoming part of the food chain. Once lodged in the soil, the munitions can pollute the environment and create up to a hundredfold increase in uranium levels in ground water, according to the UNEP." We have posted an article some years back in which we noted how Depleted Uranium dust which has settled on the battlefields of Iraq can be picked up and spread for 1,000 miles in any direction by the awfully powerful desert sand storms which annually afflict the area. This article is NEWS2063, and is entitled, "Blinding Sandstorms - How Depleted Uranium Kills An Entire Population"
You will understand that the Illuminati has silently issued a Declaration of War against all the Non-Integrating nations in the Middle East and is using the battlefields of Iraq and Afghanistan as the launching points from which this radioactive contamination is spread on a daily basis. This last article demonstrates that a great many of the Arabs understand what the West has done to them. They were alerted about two years ago when Iranian President Ahmadinejad publicly condemned America's Depleted Uranium warfare in Iraq. As this current article demonstrates, many Arabs now realize that they have been fatally contaminated. They understand and they are angry. One day, they will be so angry that wave upon wave of Islamic warriors will come against Jerusalem in complete fulfillment of Zechariah 12. That day is coming; watch your Daily News as it begins to unfold. "London, June 14 (Pal Telegraph) -There has been significant publicity about the use of Depleted Uranium (DU) munitions, its ability to travel very long distances and the consequences to our health ... Although it was widely believed that DU munitions were used extensively during the Balkans War (1991-2001) it didn't show its true face until the occurrence of an accident at a military camp in Kuwait. in 1991 ... On the 11th of July 1991, an explosion ripped through a United States ammunition depot referred to as Camp Doha killing and injuring both US and British forces ... "
"This terrible accident revealed for the first times the horrors and usage of Depleted Uranium (DU). Panic took hold of those living in the camp as the many explosions peppered the entire area with fragments of DU munitions. Those troops unfortunate enough to be injured by shrapnel or who had inhaled the dust were about to launch themselves on a very uncertain future of pain and suffering, many of whom would die from the effects of Low Level Radiation Poisoning." 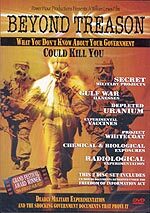 "For the first time the public were able to witness the grave danger of Depleted Uranium that had now contaminated the immediate area as well as drifting on the wind to locations further afield. This accident also for the first time revealed the warheads that are so distinctive with DU munitions. Spread over the remains of these explosions were the Depleted Uranium Rods and Sabots that frequently remain at many locations around the world and have been found in the Balkans, Iraq and Afghanistan." "Many have since died from an array of radiation sicknesses and those that have survived continue to suffer indescribable pain and suffering. This has in many cases damaged their reproductive organs resulting in higher still births and badly disfigured babies. As was the case with Agent Orange (another US manufactured product) in Viet Nam the trend continues in their siblings passing this on down the line." The End of the Age judgment upon Iraq has been unfolding since the Iraq invasion of March 20, 2003. The time is coming -- probably around 2020 -- when no living being will be alive in Iraq. Then, God's judgment to "seize and destroy the whole land" will have come to complete fulfillment. To understand the danger we are in if God has chosen us to be His hammer of judgment against Iraq, you have to understand the pattern of judgment as revealed in the Old Testament. On numerous occasions, God used a more wicked nation as His physical arm of judgment against Israel; but then, in every case, once God had delivered his judgment against Israel, He then turned around and destroyed the nation He had just used against Israel. Bible scholars call this His "Pattern of Judgment". Therefore, if America is being used to deliver God's judgment upon Iraq, He will then turn around and bring us into physical judgment. Is this the reason America is not specifically mentioned in Tribulation prophecy, while our enemies are mentioned? Is this the reason the Guiding Spirits of our Masonic Forefathers emphatically told them that our true national bird is the Egyptian legendary Phoenix Bird? 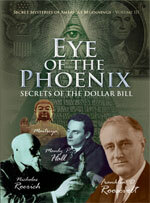 We cover this shocking truth in our newest video in the "Secret Mysteries of America's Beginnings" series, entitled, the "Eye of the Phoenix". Our Masonic Founding Fathers knew that, in the end, the America they were founding would totally burn into fine ash just as the Phoenix Bird, but that out of the ashes would come the New World Order -- the Kingdom of the Masonic Christ.